Why did the French lose in 1940? Were their aircraft inferior? Were there stockpiles of unused planes? Was defeat inevitable? Greg Baughen separates the facts from the myths. He describes the problems the French faced, the operations they flew and how, even with the available resources, defeat might have been avoided. On 10 May 1940, the French possessed one of the largest air forces in the world. On paper, it was nearly as strong as the RAF. Six weeks later, France had been defeated. For a struggling French Army desperately looking for air support, the skies seemed empty of friendly planes. In the decades that followed, the debate raged. Were there unused stockpiles of planes? Were French aircraft really so inferior? Baughen examines the myths that surround the French defeat. He explains how at the end of the First World War, the French had possessed the most effective air force in the world, only for the lessons learned to be forgotten. Instead, air policy was guided by radical theories that predicted air power alone would decide future wars. Baughen traces some of the problems back to the very earliest days of French aviation. He describes the mistakes and bad luck that dogged the French efforts to modernize their air force in the twenties and thirties. He examines how decisions made just months before the German attack further weakened the air force. Yet defeat was not inevitable. If better use had been made of the planes that were available, the result might have been different. 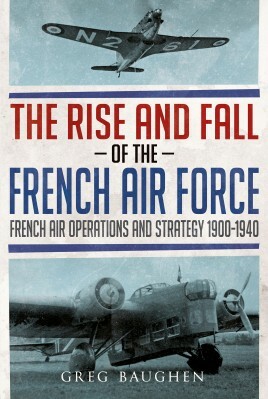 "British aviation writer Baughen gives us the first comprehensive history in English of the French Air Force through the disaster of 1940." "Get this intriguing, informative study. Recommended!"